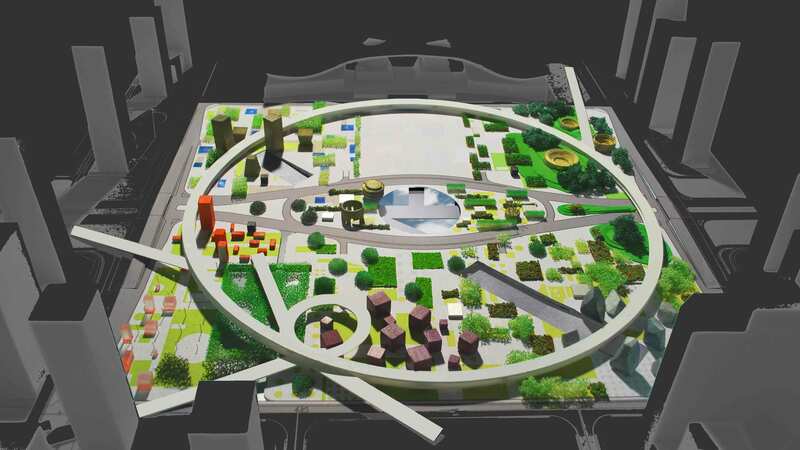 Public Landmark, Public Park, Pedestrian Walkways, Underground Connectors between Multiple Railway and Subway Stations, Retail Space; Shenzhen City of Design: Design Village, Information Center, Exhibition Areas, Administrative Buildings, Event Spaces, etc. 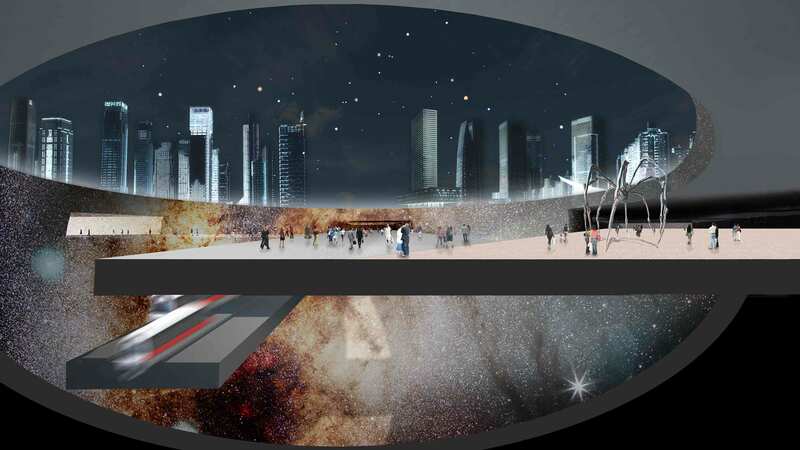 This design for Shenzhen’s new civic center, underground interchange and public landmark was awarded first prize from 32 entries by an international jury. 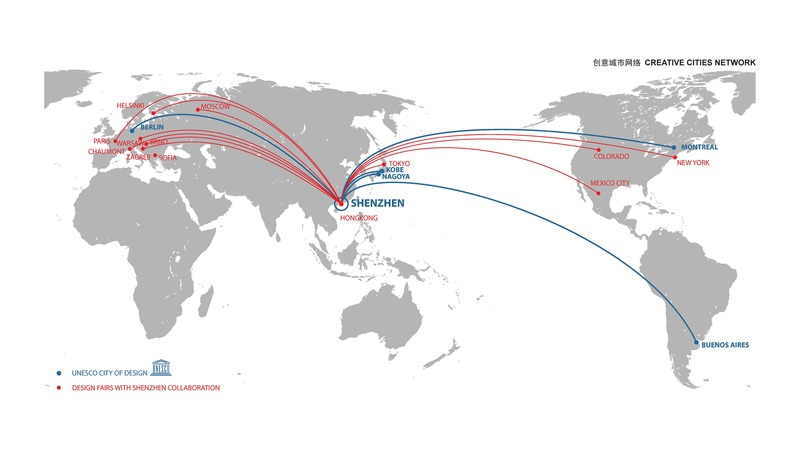 The scheme builds on the identification of Shenzhen’s recently acquired status as a “City of Design”, awarded by UNESCO in 2008, and proposes the formation of a “Shenzhen Creative Center”, a complex for the city’s creative industries adjacent to city hall. 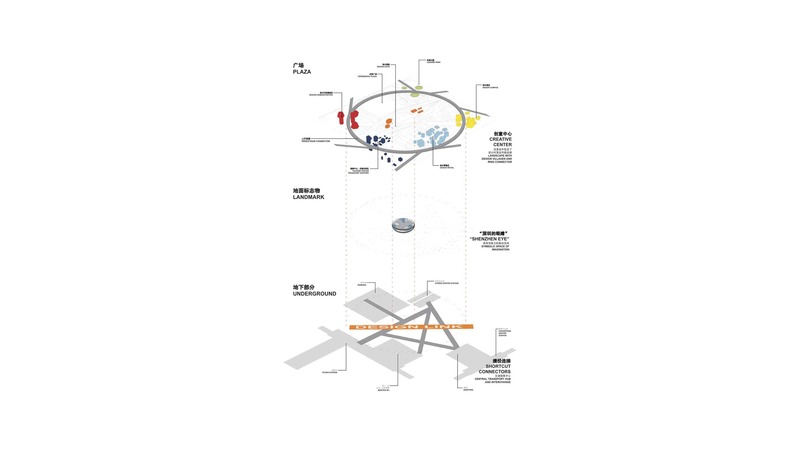 Two systems are superimposed to form the nexus of the Shenzhen Creative Center–an underground system of connectors that links existing and future train/subway stations to create a central transport hub; and a Creative Landscape with Design Villages and clusters of above-ground activity that are joined by an elevated pedestrian ring connector. 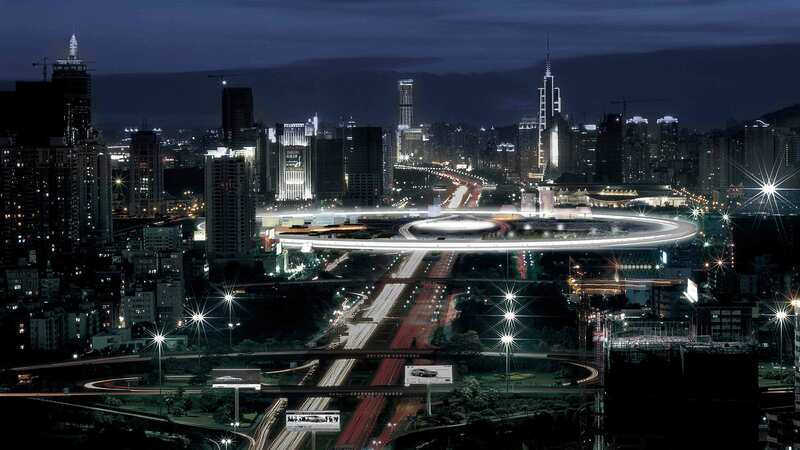 At the heart of the two systems is the Shenzhen Eye, a void as landmark of a symbolic “Space of Imagination”. An expansive 20 hectare landscape of parks and gardens, populated by clusters of pavilions and activities, and connected by pedestrian infrastructure, creates a vibrant micro-urbanism in the heart of the city. 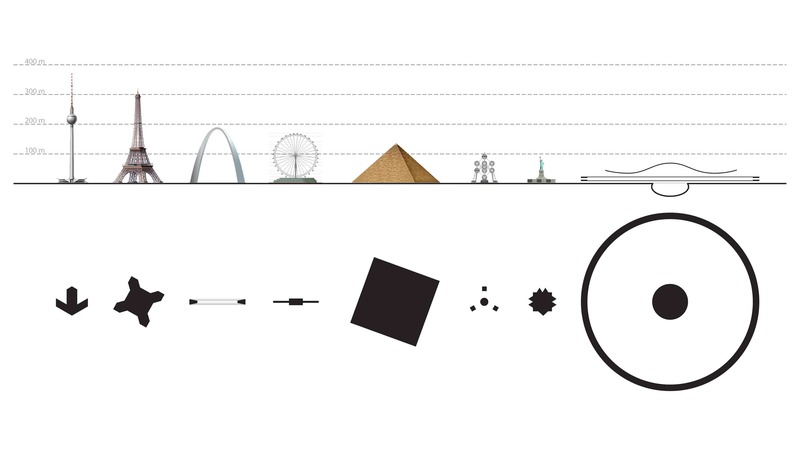 Its scale is large, but its elements are small – proportional to the nature and human beings that inhabit it. 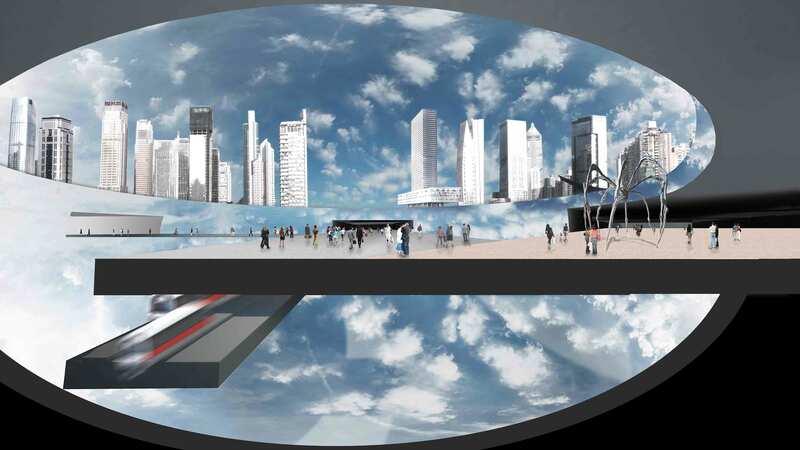 It is an urban playground with a multiplicity of condensed and flexible ad- hoc conditions – a Creative Landscape. The Shenzhen Creative Center introduces a space that fosters urbanity without density, supports aggregation through interconnected activities, and creates a focal point for Shenzhen, the City of Design. Previously dispersed creative industries will be joined through connective infrastructure and cultivated in a landscape of multiplicity, permeability, and openness towards creative activity. The combination of these elements in the Shenzhen Creative Center captures, focuses and redistributes the diverse energies of the city, and provides a stage for encounters and activities in the new center of the city.